Ticket Prices: $190 for WAM members (email [email protected] for discount code) | $230 non-members. As part of this year’s WAM Festival presented by Alcohol. Think Again, the WA Music Conference is the must-attend event for everyone from band members to producers, managers, students, industry professionals, bookers, soundies and music fans. This year WAM’s stepping up the game and offering unprecedented value, the benefits worth the cost of guaranteed extras and exclusive opportunities alone! Thanks also to the support of the Perth Theatre Trust, this year’s Conference will be held at the State Theatre Centre of Western Australia, utilising state of the art facilities in The Studio Underground, Foyer and additional rooms. Due to WA Music Conference presales setting new records, we’re psyched to give it straight back to attendees by expanding our initial promises from 40 to a massive 64 music industry heavyweight speakers now confirmed to captivate, inspire and educate audiences over the two-day event. As below, we’re excited to announce 36 new speakers to complete the line-up, including a heap more east coast and international music leaders expanding the WA Music Conference to the most power-packed yet. This will offer a dynamic environment for audiences to engage with the all-star cast from Australia and beyond in panel sessions, one-on-one meetings and networking sessions (including the debut Quay Note Boat Party). Also included will be rare opportunities to pitch your music to radio programmers from triple j, Double j, triple j Unearthed, Triple R and RTRFM. We’re also pleased to reveal Noisey/Vice Music’s Fred Pessaro from NYC will be doing a keynote address on the future of music media and journalism, and panel topics and one-on-ones will cover everything from practical masterclasses in publishing, synching, legals, tax, touring, marketing, streaming, apps, social media, recording, publicity, showcasing, radio and how to start a music business, to more thought-provoking and candid discussions on the changing face of music festivals, what makes artists exciting/‘cool’, the state versus music and more. CLICK IMAGE TO DOWNLOAD FULL PROGRAM! WAM FESTIVAL IS PRESENTED BY ALCOHOL. THINK AGAIN. PROUDLY SUPPORTED BY THE CITY OF PERTH & LOTTERYWEST. SPEED DATING SESSIONS NOW OPEN! With 64 music industry experts from all over the world now confirmed, WAM is excited to announce that exclusive speed dating sessions have been confirmed as part of the WA Music Conference, and there are speakers from all kinds of industry backgrounds here to help ticket holders and their music careers by providing FREE unique one-on-one advice on your latest music endeavors. Register at the link below before 4pm Friday 30 October for your chance to secure expert advice on your top three areas of interest, first in first picks! Otherwise the remaining registrations will be taken in person at the conference. 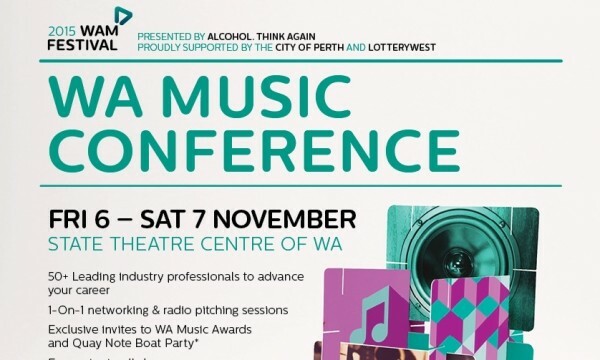 Whilst the full WAM Festival Official Program will be out soon, we thought we’d reveal the sessions planned to give you an idea of what’s to come at the WA Music Conference, the must-attend event for everyone from band members to producers, managers, students, industry professionals, bookers, soundies and music fans. With 14 panels to choose from, it’s time to start planning – or buy the last few tickets remaining to secure your place at the learning opportunities below. *Subject to availability due to limited capacity. Til 5pm Fri 25 Sept from Ticketek (or til allocation exhausted): $140 (plus booking & credit card fees) for WAM members | $180 (+ booking & credit card fees) non-members. Til 5pm Thurs 5 Nov from Ticketek: $190 for WAM members | $230 non-members.